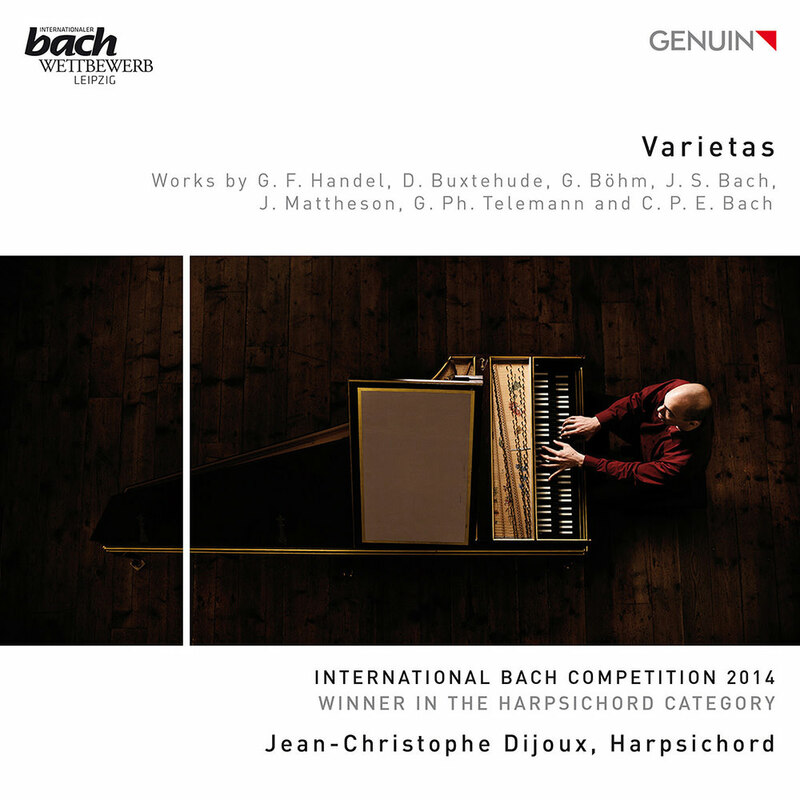 Jean-Christophe Dijoux was the winner of the harpsichord category of the 2014 Leipzig International Bach Competition, and this CD stems from that success. Born in Réunion, Dijoux studied in Paris, Freiburg and Basel, spent a year touring with the European Union Baroque Orchestra (EUBO), and won awards for continuo playing at the 2013 International Telemann Competition. Using two harpsichords (built by Matthias Kramer of Berlin after 1701 and 1754 originals) and four different temperaments, he explores music with a connection to Hamburg. Both instruments have 16’ stops, adding an impressive gravitas to the sound. Improvisation is at the heart of music of this period, and very clearly also of Dijoux’s own playing style. That is evident from the opening track (an unmeasured Prelude by Handel, HWV 573), and also in Buxtehude’s dramatic Toccata in G (BuxWV 165). The flexibility and fluidity of Dijoux’s playing reveals the underlying structure of the music while lifting the regularly-notated notes away from the page and into the realm of real music. Avoiding any sense of self-indulgence, Dijoux’s approach to the music is distinctive, elegiac and lyrical. He has an exquisite sense of musical line, and how to bring the notes to life through ornamentation and a subtle (and occasionally less than subtle, but nonetheless appropriate) sense of rhetorical gesture. The opening four Handel pieces are assembled by Dijoux into a Suite in g, concluding with the Chaconne (HWV 453). This, and the following Buxtehude Toccata, are performed in Werkmeister III temperament on the 1701 harpsichord, moving to the 1754 instrument and a Sixth-comma meantone for the Böhm Partite Jesu, du bist allzu schöne. Bach’s Toccata in g (clearly influenced by Buxtehude) is performed in the ‘Bach-Kellner’ temperament, with the remaining pieces using Neidhardt tuning ‘for a large city’. A rarely-heard part of the programme comes with three of the 48 so-called ‘practice pieces’ from Mattheson’s 1731 Grosse General-Baß-Schule. Despite their rather innocent titles, these are works of some merit in three different styles: Galant, Toccata, and operatic, all based on ‘spontaneous composition and invention’. After Telemann’s Ouverture in G (TWV 32:13), the CD concludes with another piece that belies a simple title, CPE Bach’s Rondo in C, a substantial work clearly influenced by improvisation, and given a suitably reflective and exploratory reading by Dijoux. The contrast between the gently melodic passages and the furious outbursts is exceptionally well handled by Dijoux, reflecting the ‘sensitive’ style that separated CPE Bach from the rtyle of his father. Judging by the performances on the excellent CD, Jean-Christophe Dijoux thoroughly deserved his position as a winned 2014 Leipzig International Bach Competition. A musician to watch out for.